Expensive as it may have been for individuals caught up in floods to clean up the glop, restore power and return to normalcy, it would have cost tons more for both individuals and communities to have a deluge without flood insurance. That’s the main idea, of course: You pay protection money against the possibilities of a disaster. And we all chip in with tax money for the protection of whole coastal cities, towns in the paths of tornadoes or areas where volcanoes spew. We don’t think of it as a tax or a burden even; rather, we expect to help out neighbors who’ve run into unexpected trouble. But somehow when we face the same issue involving the most basic disaster, the devastation of health through illness, we get all tangled up in convoluted debates about mandatory obligations, crushing taxes that halt investment and job-killing regulations. A new report – from an unlikely source – now underscores the obvious truths about medical care for all, one of the most troubling underlying issues of the day and certainly for November’s mid-term elections. The libertarian-leaning Mercatus Center report lays out the overall costs of medical care for the country over the next decade or so and tries to deal intelligently with getting that overall cost under better control. The cost to the federal government and to tax payments would rise, of course, but the overall number would fall. 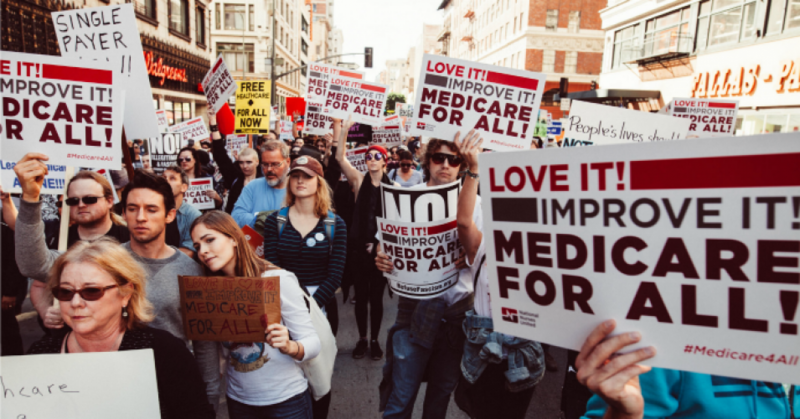 In the report, the author attempts to roughly score Sen. Bernie Sanders’ most recent Medicare for All bill and reached the somewhat surprising (for Mercatus) conclusion that if the bill were enacted the new costs would be more than offset by the new savings it generates through administrative efficiencies and reductions in unit prices, said one analysis. Along the way, 30 million additional Americans would be covered while saving billions of dollars. That overall cost runs in the trillions of dollars, of course – the report calls it $32 trillion over the next decade — without regard to where the money comes from to pay doctors’ bills, hospital costs, prescriptions or the costs to productivity from absence from the workplace. The report then shows logically that were a Medicare-for-All insurance in place in this country, those same overall costs would drop by at least $2 trillion over time. The cost to the federal government and to tax payments would rise but the overall number would fall – just as with flooding costs as subsidized by national flood insurance subsidies. That’s what happens when people actually can arrange for preventive health treatments, when medical treatments are available nationwide and when health care needn’t come at the expense of being able to pay the rent or feed a family or send a kid to college. Extending Medicare to all is an argument to provide basic coverage for health while still leaving room for private payments for supplemental insurance. It is an idea that should appeal to an allegedly populist president and consumers, to insurers, to medical providers and to politicians in need of solutions to a sticky problem. But, of course, it doesn’t because naturally, that projected rise in taxes is the scourge of Republican doctrine and that same Medicare for all approach remains the darling of Democrats. The Republicans talk about reducing taxes for individuals and skip actual health concerns; Democrats worry about health and personal choice for treatment while going easy on how to fund the effort. Now the kicker is this – that institute is backed by David and Charles Koch, the conservative funders of strict Republicanism. As such, it is an especially significant development that this financial argument for a “liberal” healthcare idea actually comes from a generally conservative source. What got the headlines was the projected rise in government spending to pay for Medicare for all, not the savings in overall health costs. Just as former President Richard Nixon was the one to break the silence with China and Trump with North Korea, perhaps the Koch brothers can help create a logic bridge about healthcare delivery costs from a different perspective. For one thing, the new healthcare report does something that seems alien to the Trump administration – actual thought about a problem with a practical, predictable result that may result in higher taxes for greater societal good. Wow. Of course, as it happens, the Koch brothers have not-so-mysteriously found themselves in the Trump crosshairs for daring to believe in global economics rather than the president’s America First tariffs ideas. This week, Trump turned his tweeting guns on the brothers to call them out for opposing him, just as he would Democratic foes. Trump and his administration continue to believe that tax reduction at any cost is the best guide for the country, results be damned. Rather than talking about improving people’s health, Trump’s folks have worked overtime to undercut remaining portions of Obamacare – the law of the land. His goal is to reduce the cost of individual health policies – without acknowledging that he is reducing actual health delivery – and remove the government from any role in providing health care to anyone but federal employees and military veterans. Thinking for the long-term does not come easily to this White House in particular. If it did, we wouldn’t be facing near-future problems from global warming, energy shortages or pockets of hunger — or even an intelligent approach to job training and job creation that is linked with rational education and labor policies. Still, the Trumpists do support building up the military – not for the moment, but toward a vision of continuing American military strength as a diplomatic weapon as well as for combat readiness. And the tax cut thinking that comes out of the White House may be crafted for a rather immediate boost to economic growth, but seems to be sold on its continuing contribution to a more productive and prosperous nation (not that is working out that way in actual effects). Bizarre as it may seem for Democrats to turn to thank the Koch brothers, it would be a most interesting turn of events to see Nancy Pelosi and Chuck Schumer, for example, take a meeting with the Kochs to open a new front in the healthcare wars. Who knows, it might even help even the political odds? Let’s help Make America Think Again.